While it may not have been the most risky move on their part, certainly one of the most surprising announcements at this years San Diego Comic Con was that WB/DC would be following up this summer's Man of Steel with a Superman/Batman movie. The announcement sent shock waves throughout the geek community, even ending up as fodder for news on day time talk shows. In other words, the public is very intrigued about DC's biggest heroes joining forces on film. 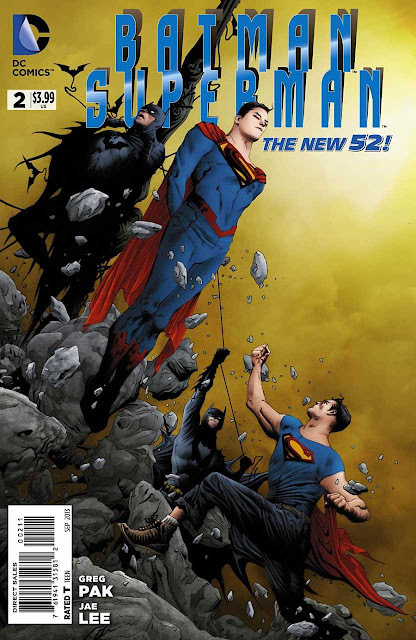 When it comes to comics, this is not a new thing by any stretch of the imagination, but it certainly means more eyes will be on new series Batman/Superman by Greg Pak and Jae Lee. With that in mind, it seemed best to take a look at this series' second issue to see how this creative team follows up on what was a spectacular debut in terms of art and story. Batman/Superman #2 sees the two characters dealing with unusual and new surroundings after their strange encounter with Catwoman in Metropolis. Batman finds himself in a different Bat Cave and in a fight with a very different Catwoman. Superman deals with seeing his adoptive parents alive again, causing further confusion and questioning of where he is. Both heroes also run into alternate versions of themselves, with both of them having a better handle on this superhero business. Although there were many things to love about Greg Pak's writing of the first issue of Batman/Superman, one of the (albeit minor) complaints about his writing was that his Superman did not feel as fully realized/fleshed out as Batman. This issue, however, seeks to rectify any misgivings one may have had with Pak's characterization. As we see Batman and Superman deal with their placement in this strange, new world, we get much of their perspective through their inner monologues. Once again Pak's Batman feels like a character he understands very well. When Bruce is teleported to the Bat Cave, he immediately realizes that this means that someone has figured out his secret identity. We also see Batman use some of those detective skills to establish why this new Catwoman is in the Bat Cave, and it is a twist that is slightly expected, yet still surprising. Where the writing of Batman is really at its strongest is when he is fighting his alternate version as this is where Pak really has some fun in showing that even dimensional boundaries do not stop Batman from being himself in any setting. What is really impressive in his writing of both characters is Pak's approach to Superman this issue, which does an excellent job of tapping into his feeling lost, confused, and emotional at the sight of the Kents. Through his writing of Superman, Pak not only gives us a sense of scope in terms of Superman's powers, but also what makes him human. Pak has such a sense of both of these characters, as established through these first two issues, that there is no question this will be a strong series while he writes it. For some readers, what really makes this an exciting arc to read is that we get to see some of the earlier days of not just the main DCU, but also Earth 2. Yes, Earth 2 is where Batman and Superman have been sent, causing some confusion for readers (more on that in a bit). While James Robinson has been doing an excellent job of writing the current Earth 2 title, that comic began with the deaths of Superman, Batman, and Wonder Woman, so, through Batman/Superman, we are getting a look at the lives of these heroes before their inevitable fate. What this means is seeing an Earth 2 that is completely different than what we are currently getting in the main book, but one that is equally as surprising/exciting. Both Superman and Batman of Earth 2 seem to have completely mastered what it means to be a hero, and, although their personal lives are certainly interesting twists on the main DCU, it is more in these heroes respective cities where the changes get interesting. Gotham is what we really get a good look at here, and it shows a city which Batman has all but completely cleaned up, but has done so in a way that makes one question the morality of Batman as well as the potential abuse of his power. Nevertheless, this issue is an exciting exploration into a more utopia-esque Earth 2. It will be interesting to see how much Metropolis is altered. It is perhaps worth admitting that this reviewer initially thought it to be a terrible idea that the way Greg Pak would be beginning Batman and Superman's first meeting was with a trip to Earth 2, but he has thus far proved it an interesting plot device. What is lost in the transition to Earth 2, however, is the understanding of some of the readers. In the wake of the release of both of these issues of Batman/Superman there has been a lot of confusion expressed by readers on social media about whether this is an alternate timeline, the future, etc. Unfortunately for those readers, Pak has done nothing in the writing of the comic to indicate where this is, although much of that can be understood when one considers the perspective with which he writes the comic. Nevertheless, it is a valid concern which could potentially alienate some new readers who pick up this comic due to the film announcement two weeks ago. It is more than likely Pak will explain this new universe to the more confused readers, but, for the moment, Earth 2 readers have a distinct advantage with this comic that is a bit unfair to those who choose to spend their money in other ways. It is difficult to think of things to say about Jae Lee's art in this issue that have not already been said by others in a much more eloquent fashion. With this issue we are treated to Lee's art throughout (another artist contributed the final pages of the previous issue), and it is a complete work of art to behold. Jae Lee's art continues to be stunning in this comic, taking a minimalist approach to backgrounds that makes this an incredibly abstract piece that is gorgeous. In this issue, Lee experiments a bit with silhouettes, and it is a test which pays of gloriously. The less is more approach to Lee's art in this comic pays off in spades, making the comic a real thing of beauty. While it can still be argued that Jae Lee's art will not work with everyone, the fact still remains that the man is drawing superhero comics on a level not seen anywhere else right now. On the whole, this issue of Batman/Superman is already a stark improvement on its opening issue for one simple fact: Pak demonstrates clearly here that he understands what makes Superman tick just as much as he does Batman. It really speaks a lot to the quality of this comic from the get go that it only had to make a minor adjustment in order to feel like it was something great. This is a true testament to the strength of both Pak's writing and Lee's stunning artwork. Although there are definitely some complaints regarding confusion over Earth 2 which would be more than valid, it is hard to not trust that, like the writing of Superman, these things will work themselves out in time. Stick with this book, people,and you will no doubt be glad that you did. Summary: Batman/Superman #2 improves upon the one area where its first issue was lacking, making for a great comic that is equally strong in writing and artwork.